The team is composed of Jack Gallimore (Bucknell University, Lewisburg, Pennsylvania), Moshe Elitzur (University of California, Berkeley), Roberto Maiolino (University of Cambridge, U.K.), Alessandro Marconi (University of Firenze, Italy), Christopher P. O’Dea (University of Manitoba, Winnipeg, Canada), Dieter Lutz (Max Planck Institute for Extraterrestrial Physics, Garching, Germany), Stefi A. Baum, University of Manitoba, Winnipeg, Canada), Robert Nikutta (Catholic University of Chile, Santiago), C.M.V. 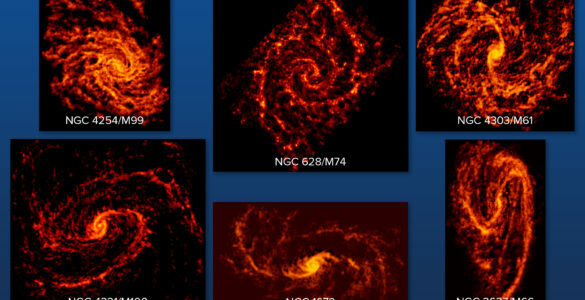 Impellizzeri (Joint ALMA Observatory, Santiago, Chile), Richard Davies (Max Planck Institute for Extraterrestrial Physics, Garching, Germany), Amy E. Kimball (National Radio Astronomy Observatory, Socorro, New Mexico), Eleonora Sani (European Southern Observatory, Santiago, Chile). 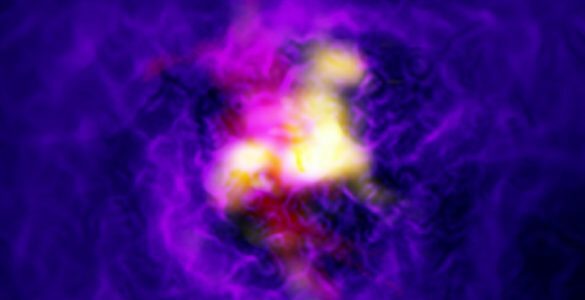 Artist impression of the heart of galaxy NGC 1068, which harbors an actively feeding supermassive black hole. 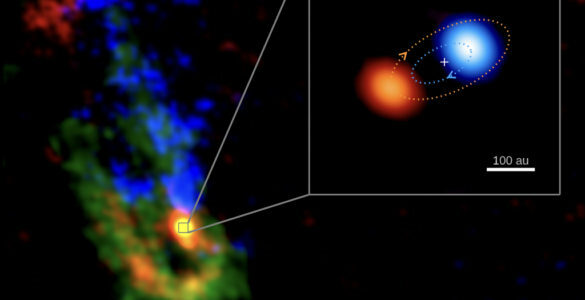 Arising from the black hole's outer accretion disk, ALMA discovered clouds of cold molecular gas and dust. This material is being accelerated by magnetic fields in the disk, reaching speeds of about 400 to 800 kilometers per second. This material gets expelled from the disk and goes on to hide the region around the black hole from optical telescopes on Earth. 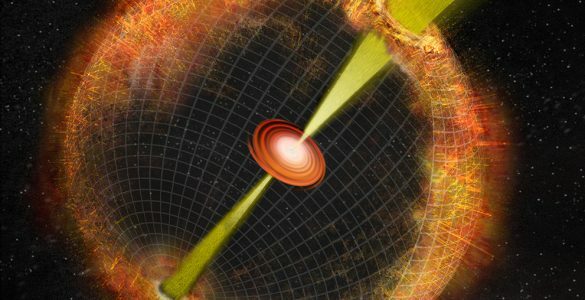 Essentially, the black hole is cloaking itself behind a veil of its own exhaust. 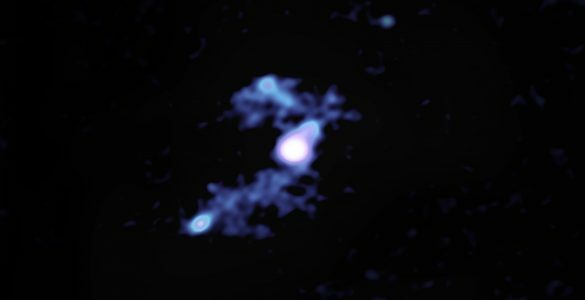 ALMA image of the central region of galaxy NGC 1068. 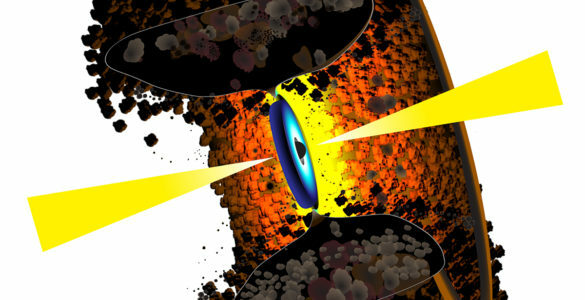 The torus of material harboring the supermassive black hole is highlighted in the pullout box. 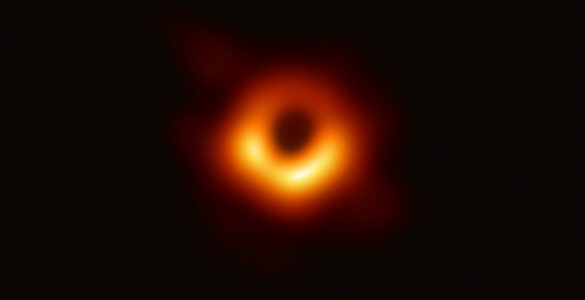 This region, which is approximately 40 light-years across, is the result of material flung out of the black hole's accretion disk. The colors in this image represent the motion of the gas: blue is material moving toward us, red moving away. The areas in green are low velocity and consistent with rotation around a black hole. The white in the central region means the gas is moving both toward and away at very high speed, the conditions illustrated in the artist impression. 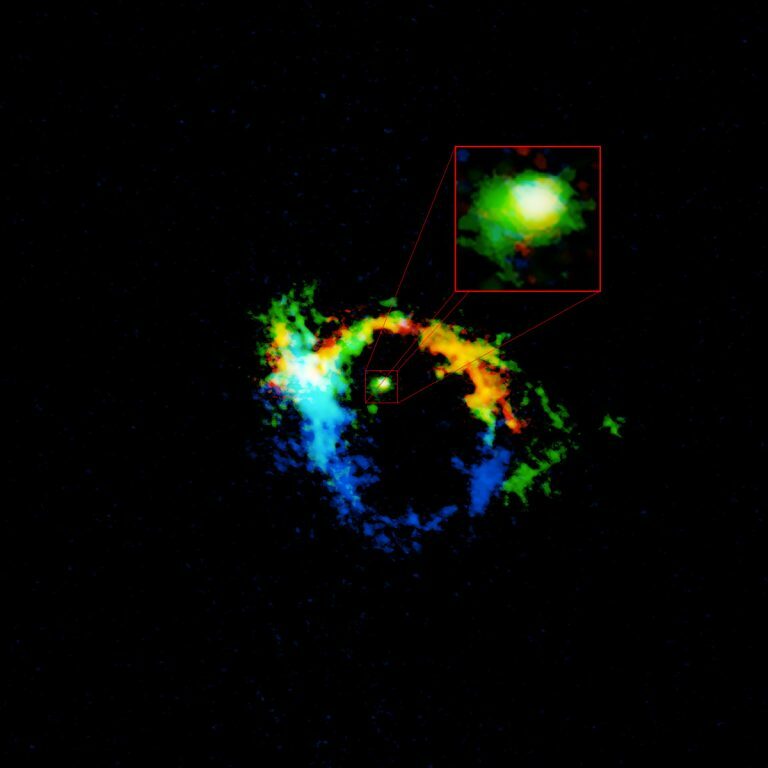 The outer ring area is unrelated to the black hole and is more tied to the structure of the central 1,000 light-years of the host galaxy.